The Art of Michael R. Gaudet: About “Dancing with Rejection: A Beginner's Guide to Immortality” ​(the Trilogy) Book 1..
About “Dancing with Rejection: A Beginner's Guide to Immortality” ​(the Trilogy) Book 1..
Michael Robert Gaudet begins his story with the early realization of his fate as an artist...whether he likes it or not. The "proof would be in the pudding", as he went on to become an acclaimed, monumental mural-painter. He very nearly suffered the same fate as his father Robert, who died of kidney failure at age31 in 1963. Robert was a tenacious and determined young man, even as he contemplated the epic unfairness of his impending, early demise. He set out to stitch together a daring and courageous plan for his own immortality, that involved genetic engineering and a brazen act of manipulating time and space. 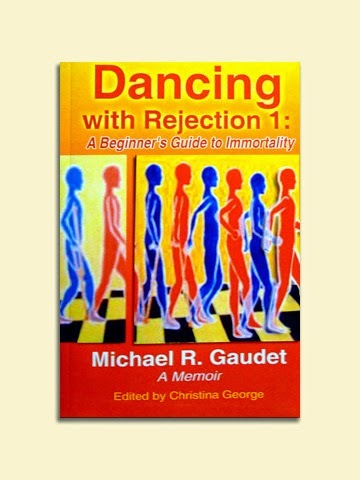 Book 1 of the Trilogy "Dancing with Rejection". "Dancing with Rejection" is at once a romping adventure that sketches vivid portraits of the mentors that would change his life, and the women that would torment and beguile him. make the best of a precarious health picture, that haunts his dreams. tenderness and tenacity, as seen through the eyes of an artist.